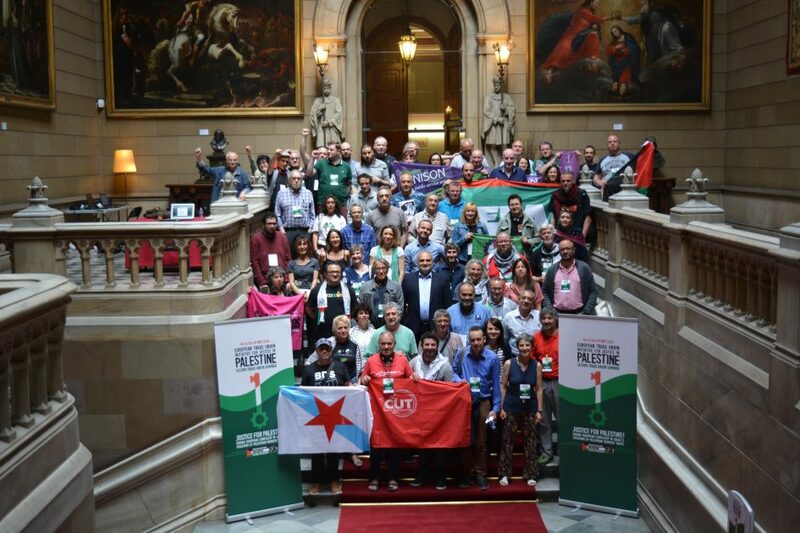 Over 70 trade union delegates representing 23 unions from all over Europe gathered in Barcelona in May at the Second Trade Union Seminar: Justice for Palestine! Ending European complicity in Israel’s violations of Palestinian workers’ rights. During the two day seminar we heard from a wide range of European trade union representatives about the urgent need to challenge and bring about an end to European complicity with Israeli human rights violations. imposing a two-way military embargo on Israel. During two-day seminar trade union delegates from 10 European countries took part in 3 thematic workshops and 2 plenary sessions. The group at each workshop came out with a number of action points to be implemented in campaigns organised by trade unions in their respective countries. After the conference the delegates dedicated a minute of silence to the victims of Israel’s recent massacre in Gaza and marched through the streets of Barcelona holding a protest rally.